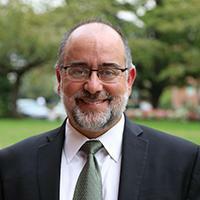 Denni s C. Galvan is Dean and Vice Provost for the Division of Global Engagement (formerly Office of International Affairs) and Professor of Political Science and International Studies at the University of Oregon. He founded and serves as Executive Director of the UO’s Global Studies Institute (GSI) within the Division of Global Engagement. Galvan received his Ph.D. from U.C. Berkeley in 1996 and his B.A. From Stanford in 1987. He has conducted field research since 1988 in a cluster of thirty villages in rural Senegal, and since 1999 in Central Java, Indonesia. His research examines how ordinary people, in unauthorized ways, dismantle and rearrange the rules of politics, economics and culture: Forced to privatize land to create markets, Senegalese farmers refused this alien imposition of new institutions. Instead, they invented a novel form of land pawning which permitted individual exchange of land, but preserved communal management of soil fertility by ancestral spirits and shamans. Indoctrinated by the media and national power brokers to hate Christians and the Chinese, political actors in Yogyakarta, Indonesia re-worked their 18th century Javanese Muslim monarch as the “Sultan of Peace.” Playing that role, the Sultan hosts interfaith prayer ceremonies and deploys so-called Javanese traditional norms to level social status difference and promote Christian and Christian inclusion (it helps that he’s promoting inclusion of his business partners). In much the same way, forced to convert to Catholicism, Caribbean slaves hid voodoo rites and gods in plain sight alongside the Virgin and the Crucifix, inventing santeria. Galvan highlights how real life within institutions is rarely just following the rules of orthodoxy, more often it’s inventing new syncretic versions of the rules themselves. Galvan’s main interest is thus tracking and understanding the politics of everyday creativity: seat-of-the-pants messing with established orders and enforced orthodoxy. Looking at how people live within institutions, Galvan finds the ongoing work of the jerry-rigger, the tinkerer, the bricoleur, who uses borrowed items, oddments and spare parts, surreptitiously lifted from official structures, to accomplish the ordinary tasks of making a living, making order, and making meaning. Galvan is especially interested in these forms of everyday syncretism in post-colonial settings and under today’s globalization. Here we find rich illustrations of enthusiastic, modernizing promotion of so many high-minded orthodoxies (from religious evangelism, to capitalism and democracy, to liberal ideas of individual human rights, and on to environmental conservation). Trace out carefully what people do in the face of newly arrived vectors of “development,” externally imposed “best practices,” and lofty ideals for global civilization, and you will find ant-like micro operations of on-the-ground sense-making, requiring dismantling, tinkering and rearrangement of the institutions that are supposed to induce progress. In this way, Galvan documents the micro-politics of the creation of many local, vernacular modernities. His recent co-edited volume, Political Creativity: Reconfiguring Institutional Order and Change (University of Pennsylvania Press, 2013, co-edited with Gerald Berk and Victoria Hattam) redefines orderly political structures as assemblages, political agency as creative tinkering, and time as a fluid resource, thus opening new terrain and techniques for tracing numerous, otherwise unseen, creative projects within political life. Galvan’s first book, on institutional syncretism, land tenure, and local governance in rural Senegal, The State Must Be Our Master of Fire: How Peasants Craft Culturally Sustainable Development in Senegal (University of California Press, 2004), won the 2005 Best Book Award from the American Political Science Association African Politics Conference Group. His 2007 co-edited volume, Reconfiguring Institutions Across Time and Space: Syncretic Responses to Challenges of Political and Economic Transformation (Palgrave Macmillan, co-edited with Rudra Sil), tracks similar grass-roots adaptations of state and economy across the developing world. Everyday Nation Building, his recent book project, explores how ordinary people in Senegal and Indonesia creatively rework traditions of kinship and structures of kingship, blurring the boundaries of ethnicity and religion, establishing informal, experiential bases for cooperation, tolerance, and national belonging. His articles on related themes have appeared in journals such as the Theory and Society, Journal of Democracy, Journal of Modern African Studies, Cahiers d’Etudes Africaines, Electoral Studies, and African Economic History. In his work as a university administrator (early on as a department head, more recently as a Vice Provost and a Dean), Galvan tries to implement the lessons about everyday institutional creativity taught to him in rural Senegal and Central Java. University systems of administration, governance, student services, faculty support and revenue generation are not extant behavior-ordering machines, but bundles of decomposable institutional raw materials. Like jazz musicians improvising off a score, the people who live within these structures — students, faculty, staff — play with and rearrange them to suit their goals. This isn’t noise in the system or defiance: it’s everyday life finding a better solution than institutional engineer higher-ed administrators can ever design. When administrators recognize their organizations as fields of ongoing, improvisational rearrangement, they can build more resilient systems, able to respond with agility to changing financial imperatives, student preferences, and societal circumstances. Galvan was a Fulbright Visiting Scholar at Université Cheikh Anta Diop in Dakar, Senegal in 2009-10, and has received fellowships and grants from the National Science Foundation, Social Science Research Council and the US Department of Education. He serves on the International Policy Advisory Council of the Association of Pacific Rim Universities, which he co-chaired from 2014-16. In 2008, Galvan received the Thomas F. Herman Faculty Award for Distinguished Teaching, the University of Oregon’s highest honor for teaching among tenured faculty, awarded to one or two individuals per year. He was also named University of Oregon Mortar Board Professor of the Term in Fall 2007 and received the University of Florida Honors Program Professor of the Year Award, 2000-01, and the University of Florida College of Arts and Sciences Teaching Award in 2000. Dennis Galvan joined the University of Oregon International Studies and Political Science Departments in July 2001. In the first four years of his career he benefited enormously from the camaraderie and mentorship of the University of Florida Political Science Department and African Studies Center, but the call to return home to the West Coast proved too strong to resist.